Zeits MOCAA Opening: Highly anticipated, rather hair-raising!? 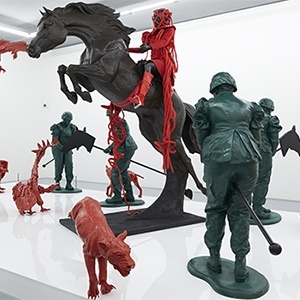 Cape Town – The much-anticipated opening of Zeits MOCAA Museum has finally arrived – and a visit through the grand doors into the restored trendy Silo District in the V&A Waterfront proves to be a hair-raising experience for more reasons than one. A geometric marvel in its own right, the museum structure is a seamless collaboration where architecture and art meet. Yet it is unique in combining the usual white walls we see in art galleries with the raw concrete of the silo. The building is simply nothing short of mind-blowing - even if you are not an art-lover or architecture fanatic. The museum’s design and the display of artwork influence each other, in a new creative paradigm - redefining the way we consume art. High walls, curvature of the silos, the way natural light enters parts of the building or installed lighting creates shadows, the spiraling staircase leading to corridors and galleries which curve and flow from one exhibit to the next, all add to the overall viewer experience, while giving artists a unique and interesting exhibition space to play with. After marvelling in the sheer originality and skill it took to restore the silos and transform it into an art gallery – I couldn’t help but feel goosebumps as I took extreme delight in touring the maze-like design of the museum. I felt like Alice going down the rabbit hole, or Narnia entering a new world. But my hair-raising adventure didn’t end there. After entering a corridor, up a few flights of spiralling stairs, through a narrow passageway, pass glass doors and a few exhibits, I reached white doors that appeared to have a child’s drawing all over it. I entered filled with glee. Two exhibit viewers walked out saying “it’s creepy” … I walked in anyway. As I opened the doors I was faced with wall covered in child-like drawings of faces and scribbles, in a room dimly lit … strange sounds came from inside. I bravely turned to my right and stared straight at a person sitting a table, who appeared to be writing. My initial reaction was to say hello – but then I realised his eyes were still, his grim look turned eerie. And then it hit me - he wasn’t real! I turned straight for the door (which luckily was just behind me), quickly snapped a few (blurry) pics on my way out, looked to the left of the door to find a sofa with what appeared to be a child lying on it (creeped me out even more) and headed out. I couldn’t bring myself to venture past “the man” alone and explore the rest of the exhibit – in fact, I was so sacred, if you cannot tell from the blurry pics used in this video above. The synergy in this space conjure all sorts of emotions. I only briefly ventured through one of the galleries, yet I had the most memorable experience I’ve ever had in a gallery museum. Staff at the museum say there are six galleries and I suggest setting aside at least a full day to make the most of this museum masterpiece. let alone a morning. David Green, CEO of the V&A Waterfront, says that artwork on display is from the African diaspora and people whose production is linked to Africa. While in collaboration with museums around the world, the museum aims to provide a regional spread and diversity, keeping in line with what the museum’s goal to create accessible, contemporary art for Africans. There is no doubt that this museum will cement Cape Town, South Africa and our continent on the map as a leading venue to appreciate art. Official Opening Date: 22 September 2017. Exhibit: Click here to see the full programme. Tickets: Daily admission - R180 per adult. Online tickets: Tickets available at Webtickets. Tickets are valid for 7-days and are non-refundable. Under 18: Enter free. To ensure access for all, children under the age of 18 years can visit the museum and enjoy cutting-edge art from Africa and the Diaspora free of charge. Wednesdays: Free entry for South Africans and African citizens, between 10 am – 1 pm. First Fridays: Half price admission between 4 pm – 9 pm every first Friday of the month.